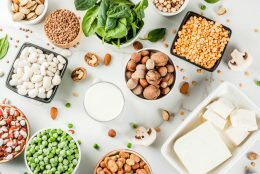 Shutterstock Vegans can get their protein from beans, tofu, nuts, tempeh, seitan, seeds, grains and more. In our culture, where we are told protein is king and milk is necessary for strong bones, we grow up drinking the Kool-aid of propaganda provided by the government and meat and dairy industries. The most similar parallel I can draw is the blind trust characters in “The Giver” bestow upon the government with their pill regiments and altered history. Plant protein sources lack all of the undesirable consequences of meat and dairy protein sources, such as heart disease-causing cholesterol, cancer-causing heterocyclic amines and antibiotics, pesticides and hormones to keep the animals fat. As an athlete, it was an easy decision to choose a plant-based diet. It’s a widely known fact in the sports world that this diet will decrease recovery time between workouts by reducing inflammation. Simply ask the many professional athletes who have found success with plant-based lifestyles, such as Venus Williams, Scott Jurek and Kendrick Farris. By not consuming the bacterial endotoxins found in animal products, our bodies do not produce an inflammatory response and our arteries do not stiffen. The National Dairy Council recommends consuming more milk and dairy to prevent osteoporosis, yet dairy products show little to no benefit to bone health. Our country’s dairy consumption is the main source of saturated fat, contributing to heart disease, type 2 diabetes and Alzheimer’s. Dairy has also been linked to breast, ovarian and prostate cancers. Are you worried about not getting enough calcium? It can be found in leafy green vegetables, beans, fortified juices and plant milks, and is more easily absorbed than animal calcium. Of course, we are never taught the pitfalls of the Western diet in high school or college. Instead, we are inundated with commercials of Olympic athletes drinking milk after workouts and countless fast food advertisements. I understand most people are misinformed about the field of nutrition, but do your homework before you attack a vegan with a question that may come across as ignorant. Nicholas Walker is a junior majoring in biomedical engineering.